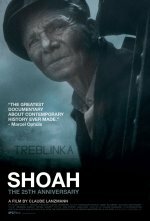 Twelve years in the making, Shoah is a nine hour epic on the Holocaust feauting interviews with survivors, bystanders and perpetrators in 14 countries. Shoah release date was Wednesday, October 23, 1985. This was a New York release.